Chile, Bolivia, Perú 2009 "In the Andes"
In the frame of the International Year of Astronomy (IYA2009), GalileoMobile traveled through the Andean regions of Chile, Bolivia, and Peru during the months of October and November 2009. On-board two pickup vans loaded with telescopes and educational material, GalileoMobile covered a total travel distance of almost 7000 km. The itinerary included 23 stops in different localities, reaching a total of 33 schools, which represented close to 1800 students and 600 teachers, plus a substantial number of local people that were present in different events such as star parties for the community. In total 3000 people. These experiences were recorded in the documentary "Under the same Sky". 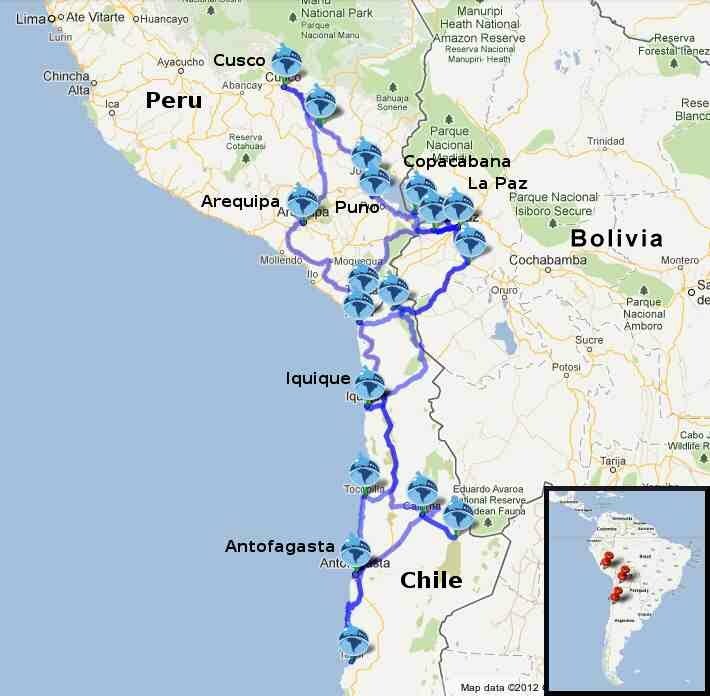 Roadmap of the In the Andes expedition around the andean region of Chile, Bolivia and Peru. The choice of destination was based on the deep tradition South America has in astronomy. These three countries in particular share the heritage of the great Inca and Tiwanaku cultures, undoubtedly some of the most important pre-Colombian civilizations. The road-map was drawn through the Altiplano, the highland plateau of the Andes, which offers a high sky purity and coincides with the location of the Inca and Tiwanaku empires. Video of the presentation of the project and the expedition. Produced by ESO. During these visits we organized educational games, designed simple experiments and exchanged myths and stories about the stars. During day-time we observed the Sun in the school's courtyard using solar ND filters. Whenever the weather permitted we also organized star parties which were open to the public to observe the Moon, stars, planets, and other celestial objects with telescopes kindly lent by the IYA2009 Secretariat. Finally, we gave a Galileoscope as a gift to every school we visited (a donation of IAU and UNESCO) along with an inflatable Earth globe (a donation of our partner UNAWE), as well as astronomy posters and postcards from our collaborators in ESO. We want to thank all the people who helped us during the preparation as well as during the trip. Thank you for supporting us and sharing our vision!